Happy Anniversary Tuesdays with Dorie! And happy new year! To celebrate Tuesdays with Dorie’s third anniversary, and to ring in the new year in style, Laurie and Jules selected Midnight Crackles for this week’s recipe. 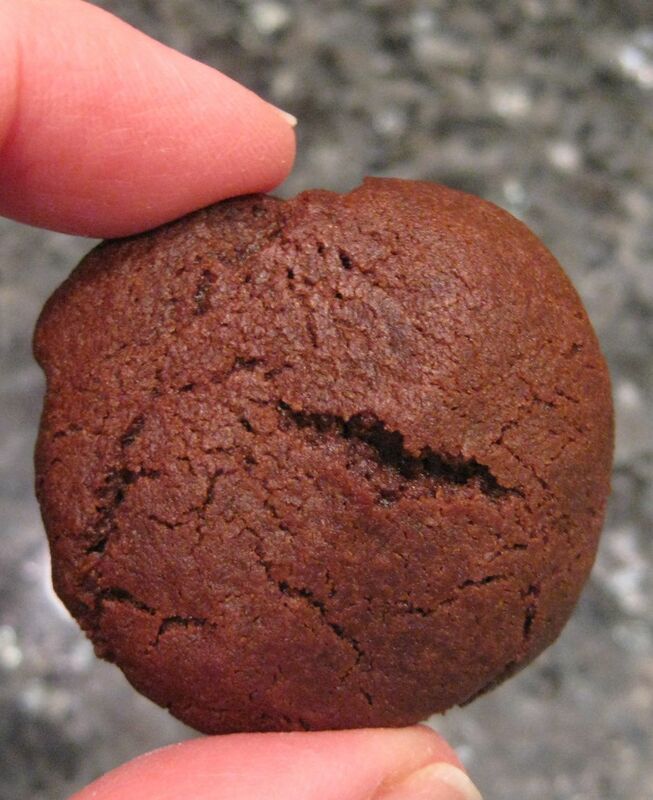 With bittersweet chocolate and cocoa powder, plus cinnamon, these are dark and spicy little cookies. What I did: I made half the recipe and omitted the cloves. The dough needs to be chilled, so I made it one day and baked it the next. How it went: The recipe says that if the chilled dough is solid, let it sit for 30 minutes before forming it into balls for baking. My dough was extremely solid and I let it sit out for almost two hours before I could handle it. I wasn’t sure how much to flatten the balls before baking; the ones that I flattened more looked a little nicer in the end. They didn’t look crackly like I expected them to. The one pictured above has one large crack, but I wouldn’t call it crackled. How it tasted: I tried one and thought hmmm. It was fine, but lacking any oomph. My husband tried one and said it seemed like it was missing something. I did skip the cloves because we don’t care for them, so I don’t know if that was the oomph they needed, or if I actually did forget an ingredient, or if these just aren’t our thing. You might want to check out some of the other TWD bakers’ blogs to see what they thought; I bet others had better luck with these than I did. You can find the recipe on page 74 of Baking: From My Home to Yours. Or look here on the TWD site. It may be just one of those thimgs that don’t appeal – we all have those. They look delish though. Happy New Year! These were not quite my thing either, but still okay. I left out the spices, too, and drizzled the tops with white chocolate. I have other chocolate cookies favorites, but am always happy to play along with TWD–especially for the 3 year anniversary. I think if they had some frosting on top that would make them extra good! I cut the recipe in half too! I went a little heavy on the spices and the cookies turned out fine. Not for the kids, though. Good chocolate cookie. U would up the cinnamon next time. Dough was really hard to work with, but cookies turned out well. They look cute…and I can see the little crackles in them. Guys had a couple and I packed the rest in the freezer to send to a swim party this weekend. They said they couldn’t taste the cloves or the cinnamon, just the chocolate. The great thing about guys is that they aren’t that picky, if it is food, esp. chocolate, and available and portable, they WILL eat it and declare it delicious nine out of ten times. I have no idea if I am a good baker or not…lol! I was a little meh on the first day but I thought these got better over time. Happy new year! I was worried about the cloves (and the dough since it was so hard to work with); I actually ended up really liking these, though. Sorry they weren’t a hit, but I guess it’s not too bad to start the new year not eating too many cookies. I made these too, and I agree with you. If I tried the recipe again, I might try adding something a little extra. Maybe it really is the cloves, as I left them out too. The sure look good, but maybe the cloves do make a big difference on the taste. Happy happy new year! Your cookie looks great! It’s the cloves Jill – you should have added them. 🙂 Seriously, they LOOK wonderful – and are perfect for “add ins” – for next time!